Every Tuesday night from 6 PM till dusk until September 30th, 2018. Come out and see the Classic Cars and Trucks! The Caygeon Cruisers is one of the most active car clubs in the area and is dedicated to the preservation and enjoyment of classic and custom cars and trucks. 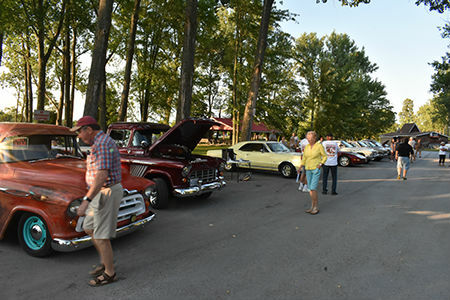 Each Tuesday evening the club members along with other car owners meet in Bobcaygeon, at the Beach Park, which is located on Park Road (CKL 24), to display their rides and enjoy the company of other car enthusiast. This event starts at 6 PM and continues till dusk. If you are interested in classic cars, whether you have your own "special" ride or not, please join us for a pleasant evening, and meet some of our friendly members. We look forward to seeing you at one of our regular cruise nights or at our annual show.